Mrs Obama recalled how “warm, gracious and intelligent” she thought Queen Elizabeth II was after first meeting her in 2009. Speaking to a crowd of 15,000 people gathered in the London O2 Arena on Sunday night, the former US first lady confessed how moved she was by the Queen’s decision to wear a small pin badge the Obamas had given her. 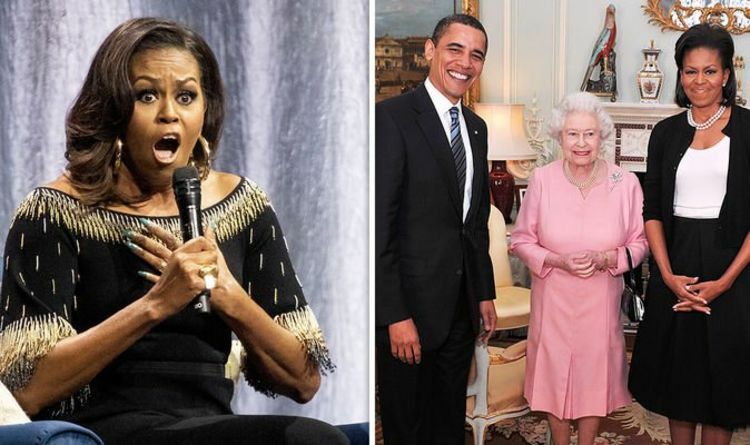 Speaking during the tour promoting her autobiography, Becoming, Mrs Obama said: “We were standing in line and the Queen had on a beautiful dress, I’m sure it was covered in diamond, and a crown, you know you sort of looking at that and think ‘all of that is real’, that’s nice but is all real. Mrs Obama and her husband, who has been president of the US between 2009 and 2017, were touched by the kindness the Queen reserved them during the hours they spent together, the former first lady continued. The trip to the UK made by Mrs and Mr Obama in 2009 is also remembered because of the backlash the first lady received after breaking the protocol by hugging the monarch. Upon meeting the Queen, women are usually expected to curtsy, and every form of physical contact but a light handshake is absolutely forbidden. But Mrs Obama ignored the unwritten royal rules and put an arm around the monarch’s shoulder. After joking about it with the London crowd saying “yikes! Sorry guys”, the former first lady explained she would behave in a different way even if she had the chance to go back in time because hers was “a natural human reaction”. She said: ”I learned over the course of my time on the international stage to see that either hold my hands together tightly or behind my back to sort of kind of just make sure I was thinking before I reacted naturally.